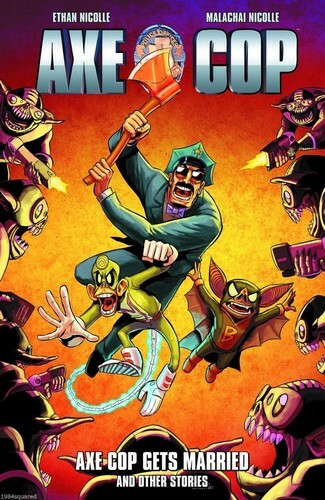 After a messy divorce with Abraham Lincoln, Axe Cop is determined to find a new wife to help raise his newly adopted bat and monkey children in Axe Cop Gets Married! Also features the epic bowzer battle story The Dogs, multiple "Ask Axe Cop" episodes, guest comics, "Axe Cop Presents," and much more awesomeness! 160 pages, full colorAxe Cop has been appointed president of the whole world! But what will Axe Cop and his friends do in a world with no bad guys? Look to defeat the bad guys from outer space, of course! Written by 8-year-old Malachai Nicolle and drawn by his 31-year-old brother Ethan Nicolle, Axe Cop is commander in chief of hilarious adventures as only a kid could imagine!